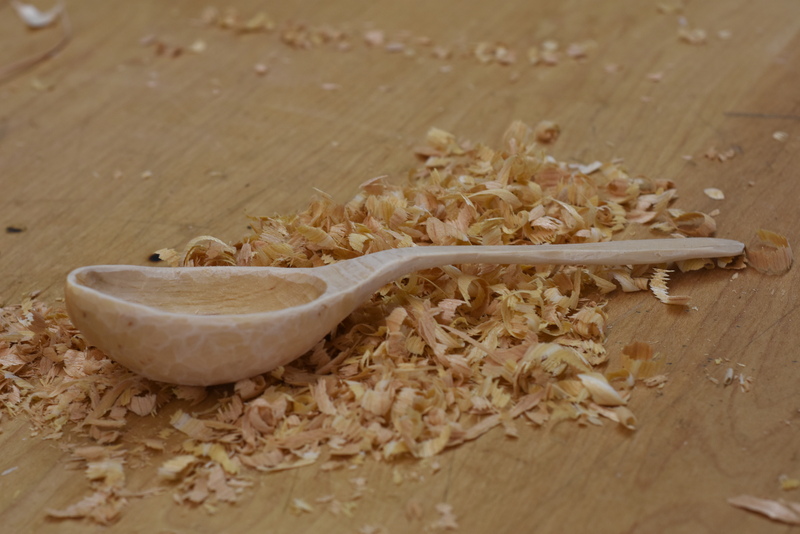 Visit spoonderlust on Etsy to order one of these new spoons! The jar tool on the far right side is sold. 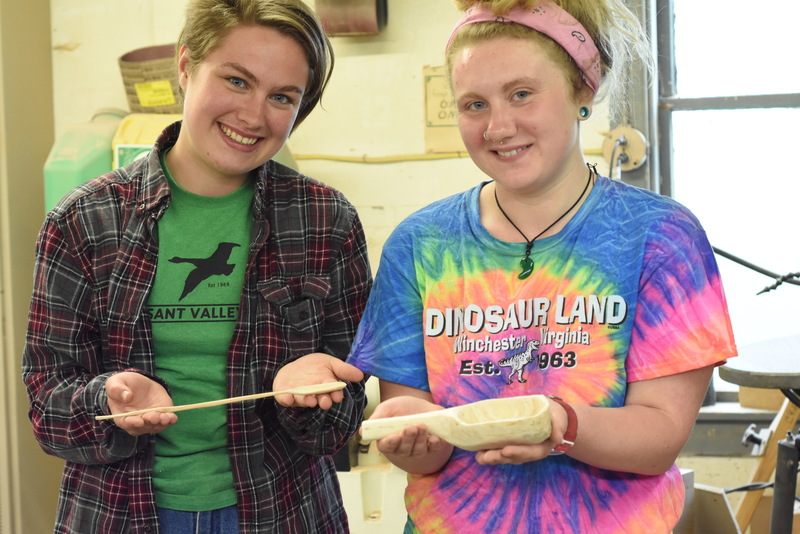 These awesome guys, Jake and Nick, dove into some spoon making in the woodshop on the off day between snowboarding adventures. Great working with you fellas! 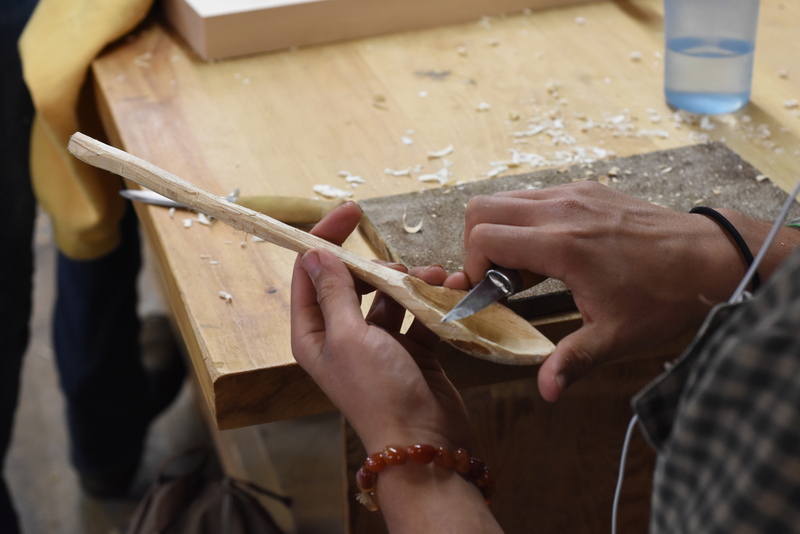 Visit Daniel Marcou’s very nice blog www.woodenspooncarving.com where he has graciously posted an interview with me about spoon carving. 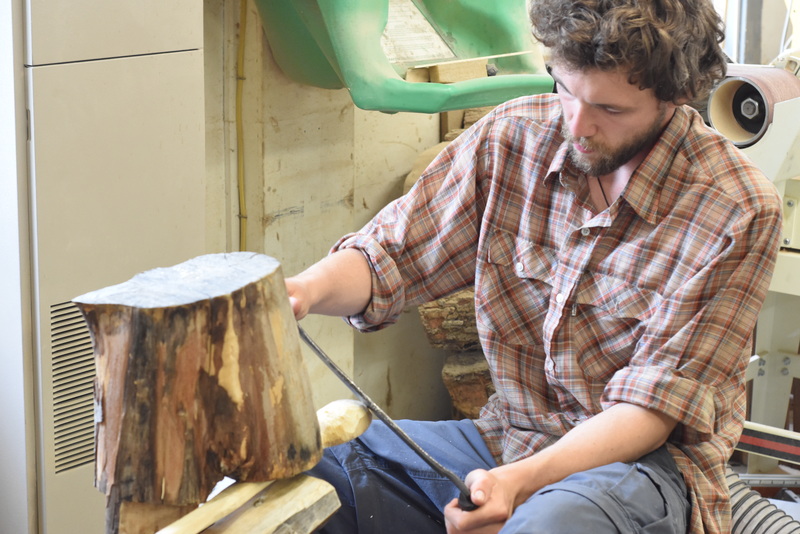 While there, check out Daniel’s writing about his own spoon making, other interviews, and links to other spoonmakers. Thanks for your efforts Daniel! These recently finished spoons will be available on spoonderlust on Etsy in the next few days. 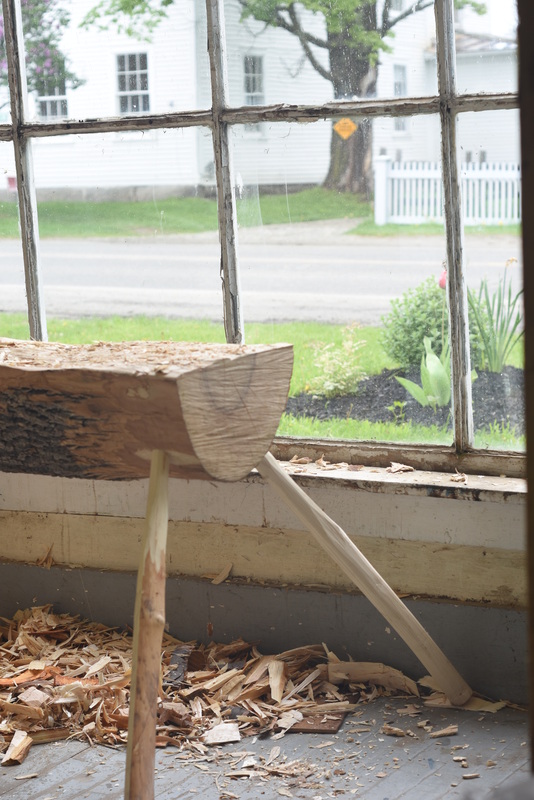 The wood was harvested on our land last spring, processed into billets, and stored to retain moisture. 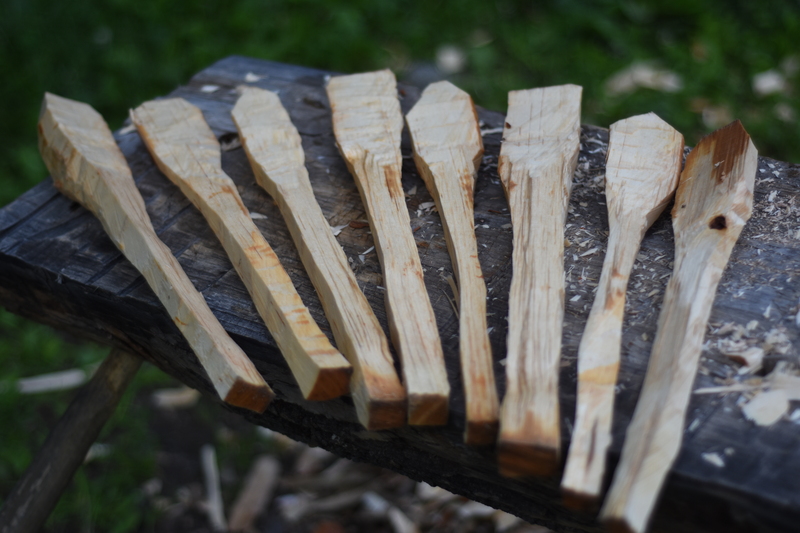 I am working on finishing 11 more spoons from this batch of wood. Close up of some embellishments. 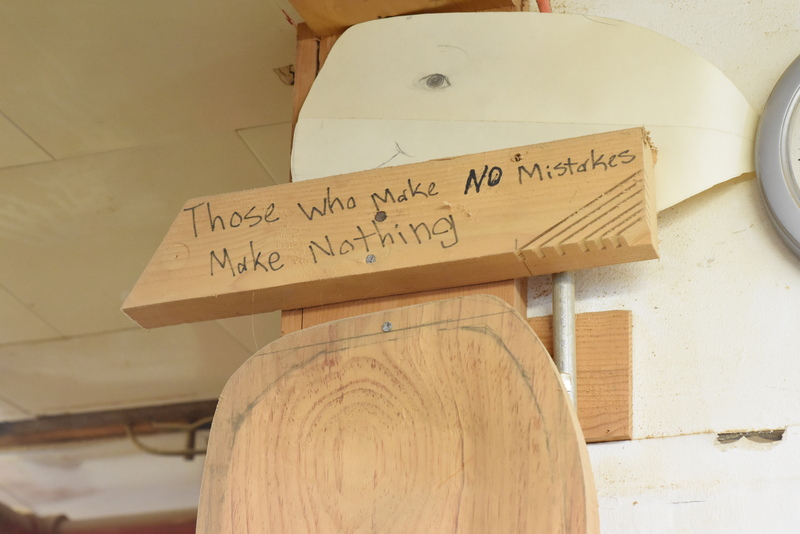 Done by pressing the tip of my carving knife into the wood. The bowl from the top. 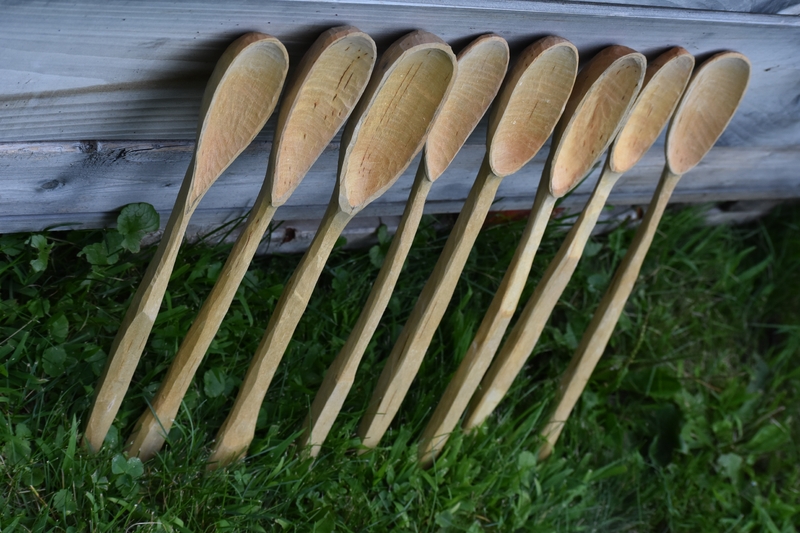 This set of 8 Paper Birch Kitchen Spoons comes from this one round of wood. I’ve riven out the billets here, and tied the wood back together with twine for illustration. 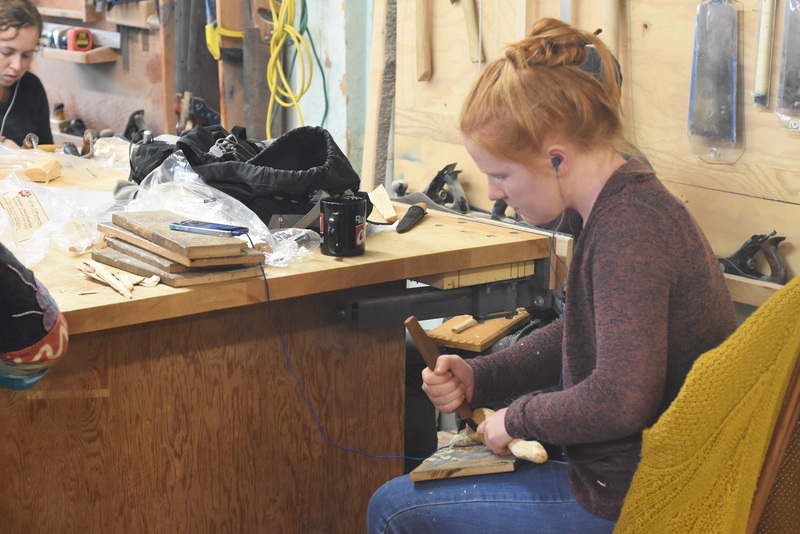 The billets are roughed out with the hatchet. 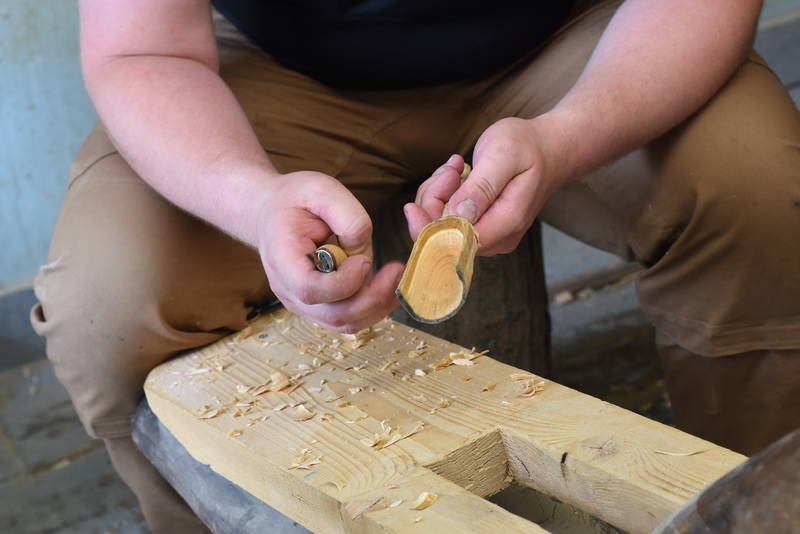 Further reduced into spoon blanks using the drawknife and shaving horse. 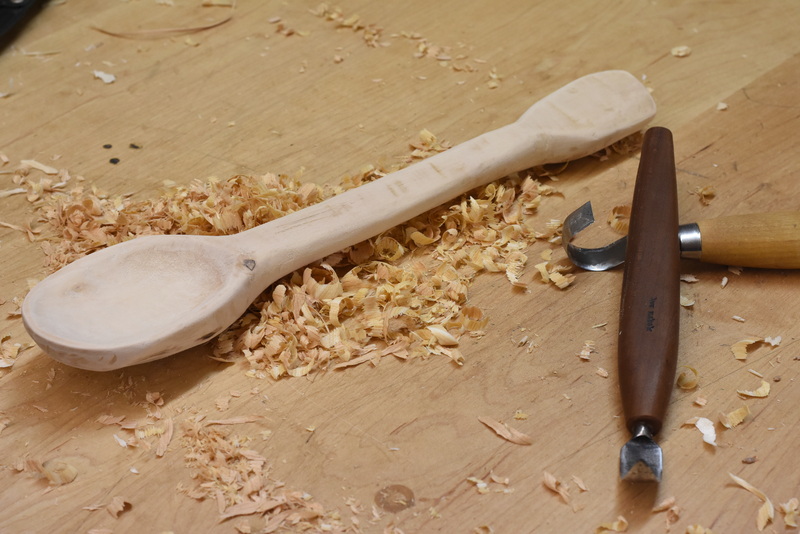 The #5 spoon’s bowl is roughed out with the bent knife. 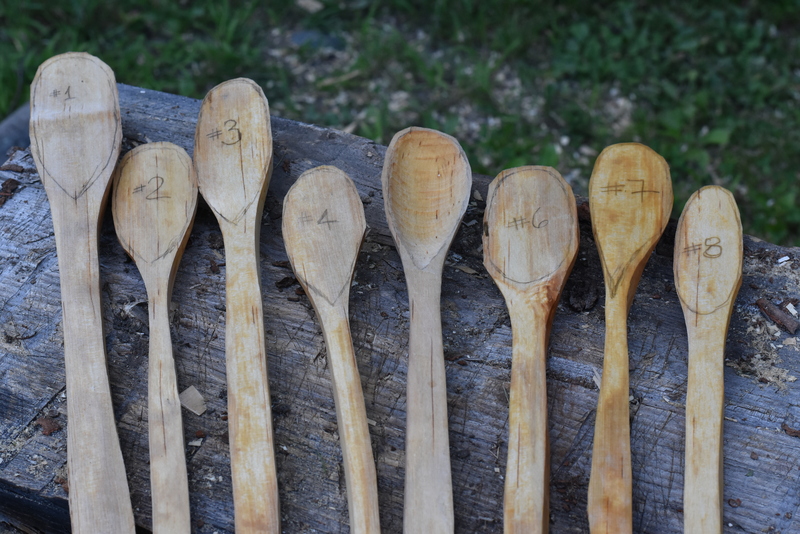 Drying process complete, the spoons are ready for the last go round of decorative finial carving and a touch of light sanding. All the finish carving complete, and lightly hand sanded for a few minutes each. Ready for oiling. Finished with organic olive oil. People of all ages and from all walks of life and from all parts of the planet benefit from the complex living breathing organism that is a forest. Some may never have the distinct benefit and privilege of setting foot in one, and others may never stay in the forest for long enough to consider it an experience. Still others live on the edge of, inside, and with the forest. Those who have spent time in the forest might agree that, if nothing else, it is a remarkable place, a place that draws us in. Forests are complex places, and no less complex than everything else outside their edges. But somehow, unlike everything else, they are a place of their own. You can tell when you’ve entered, and when you’ve left, when you are close to one, and when you have been away from one for too long. Reverence for trees might sound odd coming from a person who cuts trees down for the purposes of trail building and firewood, craft and more garden space. All that I do could be a mistake; I am at best fallible. But I do take from the forest, slowly, “by hand”, without a tractor or horses. And in 15 years getting to know a small part of the forest, I’ve seen and been a part of the changes there. I’ve never felt greedy or wasteful. I believe that what I have taken is from an abundance, and what is left behind is a reflection of the changing, vivid, diverse, and ever-evolving or devolving person that I am. It is a relationship, impacting both parties. 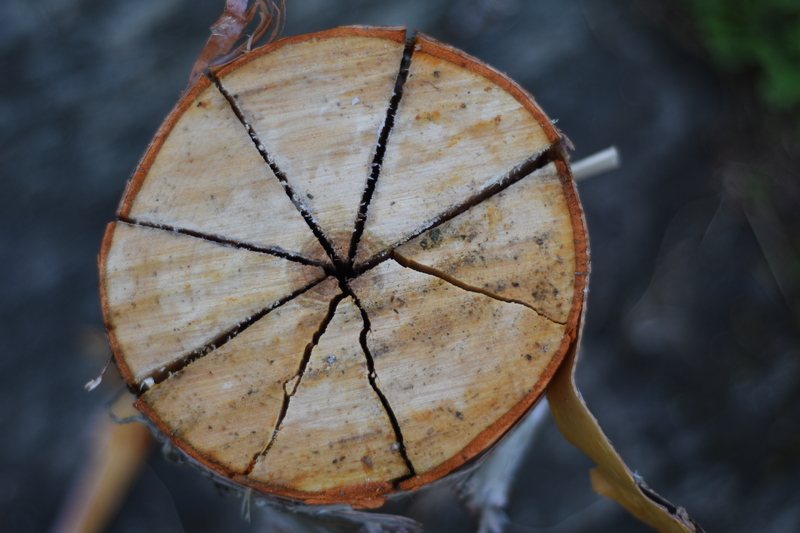 Gratitude ebbs and flows depending on whether I am dragging logs uphill or downhill. But I’m not fickle; my passion for the forest overrides any temporary difficulty I may be having. I sometimes feel if I stay too long, I might not be able to come out. The students I had the distinct privilege of working with last week at Sterling College in Craftsbury, VT were graciously friendly. I feign teaching, as what I do is really share something that is such a joy to me it is difficult to contain myself. 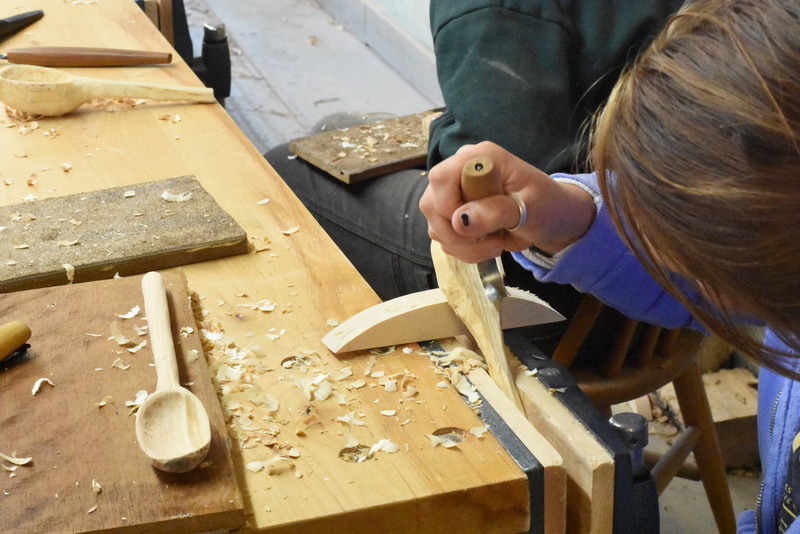 I have to really slow down in describing and demonstrating the steps in making a spoon, yet all the while I do not want to bore the students or belabor the points. 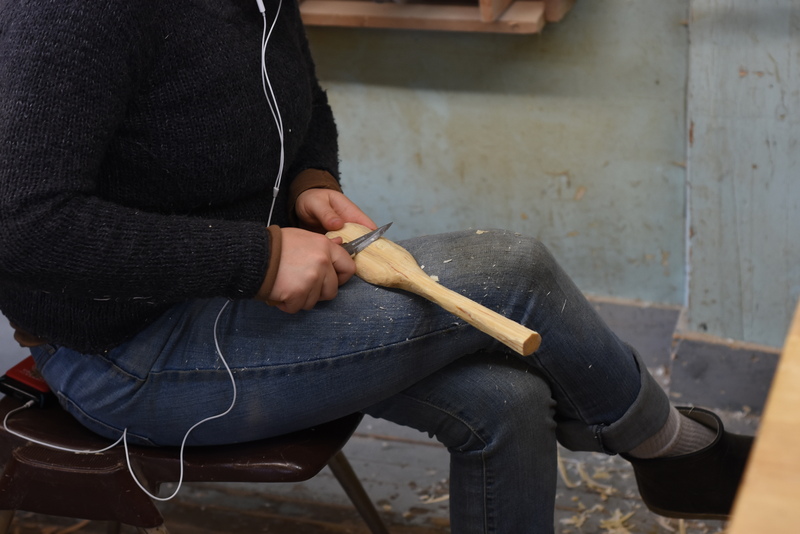 I don’t think I’m making this up: Spoon making has a disproportionately large number of “ah-ha” moments. On a small-scale, we realize what we are capable of. Wheels start spinning. The disconnection and displacement from all that was for thousands of years narrows quickly. 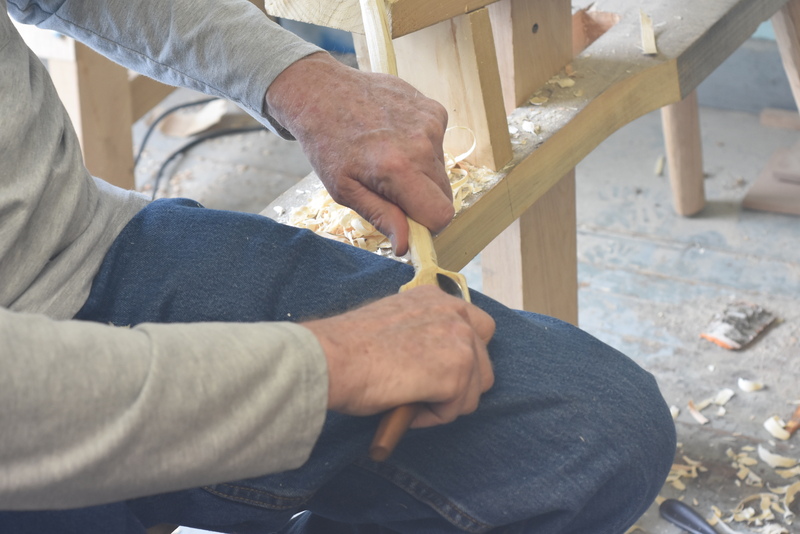 The hands, making things, using tools, together, talking. I’m a sap, and it is beautiful. So as I always say, thank you for sharing your time with me, and tending my fire. Your enthusiasm is a joy to witness.